Quilty Habit: Leaving for QuiltCon! I'm all set to go! The bags are packed (for the most part) and I'm trekking to the airport at 4 am, en route to Austin, TX. It will be the furthest west I've ever traveled, and on my own, too. I will have lots to report on when I return next week, but until then, I'll be Instagramming as much as possible (@quiltyhabit)! 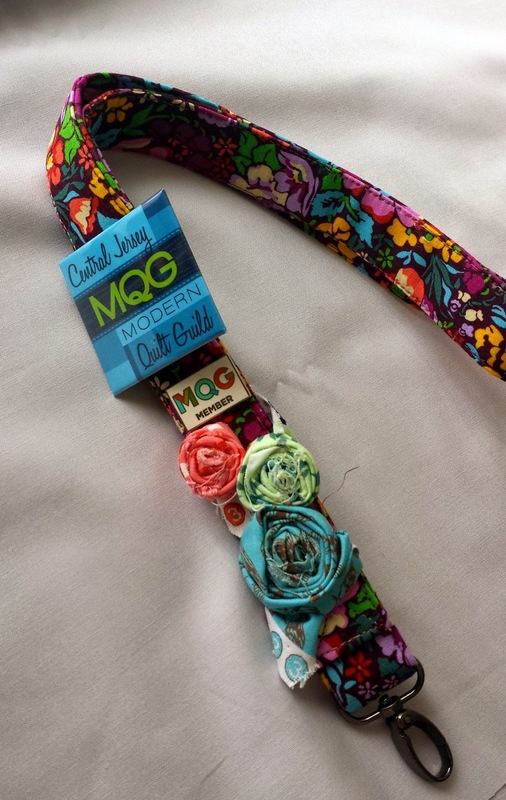 This is the lanyard my secret partner, Katherine (@kakiofhoneyhill) made me for the QuiltCon lanyard swap! I love it sooo much (especially those selvage roses). I hope I get to meet her and thank her in person. I can't wait to meet the Sisterhood of the Traveling Quilts (those that will be there) and trade our Round 2 starter quilts! And that's just tomorrow night. This whole trip will likely be a whirlwind! Safe travels and see you soon!! It totally was a whirlwind! I wish we lived closer and visit more often! !